10 If you roll over your payment to a Roth IRA You can roll over a payment from the Plan made before January 1, 2010 to a Roth IRA only if your modified adjusted gross income is not more than $100,000 for the year the payment is made to you and, if married, you file a joint return. These limitations do not apply to payments made to you from the Plan after If you wish to roll over the payment to a Roth IRA, but you are not eligible to elect a rollover to a Roth IRA until after 2009, you can elect a rollover to a traditional IRA and then, after 2009, elect to convert the traditional IRA into a Roth IRA. 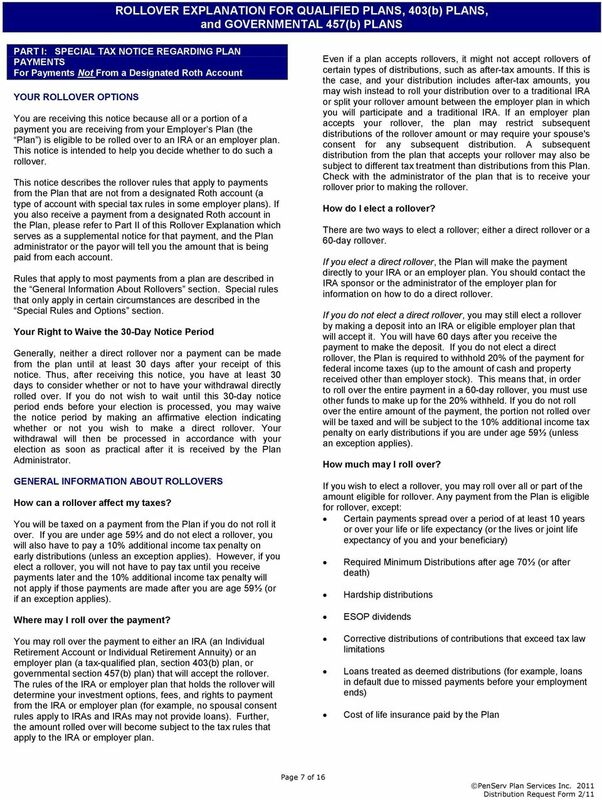 If you are not a plan participant Payments after death of the participant. If you receive a distribution after the participant s death that you do not roll over, the distribution will generally be taxed in the same manner described elsewhere in this notice. 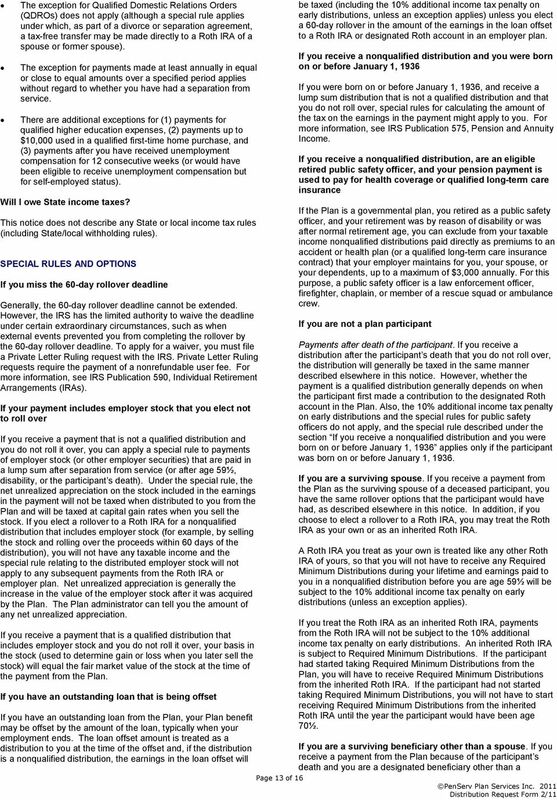 However, the 10% additional income tax penalty on early distributions and the special rules for public safety officers do not apply, and the special rule described under the section If you were born on or before January 1, 1936 applies only if the participant was born on or before January 1, If you roll over the payment to a Roth IRA, a special rule applies under which the amount of the payment rolled over (reduced by any after-tax amounts) will be taxed. However, the 10% additional income tax penalty on early distributions will not apply (unless you take the amount rolled over out of the Roth IRA within 5 years, counting from January 1 of the year of the rollover). For payments from the Plan during 2010 that are rolled over to a Roth IRA, the taxable amount can be spread over a 2- year period starting in If you roll over the payment to a Roth IRA, later payments from the Roth IRA that are qualified distributions will not be taxed (including earnings after the rollover). A qualified distribution from a Roth IRA is a payment made after you are age 59½ (or after your death or disability, or as a qualified first-time homebuyer distribution of up to $10,000) and after you have had a Roth IRA for at least 5 years. In applying this 5-year rule, you count from January 1 of the year for which your first contribution was made to a Roth IRA. Payments from the Roth IRA that are not qualified distributions will be taxed to the extent of earnings after the rollover, including the 10% additional income tax penalty on early distributions (unless an exception applies). You do not have to take Required Minimum Distributions from a Roth IRA during your lifetime. For more information, see IRS Publication 590, Individual Retirement Arrangements (IRAs). If you roll over your payment to a designated Roth account in the same plan If you roll over the payment to a designated Roth account in the plan, the amount of the payment rolled over (reduced by any after-tax amounts directly rolled over) will be taxed. However, the 10% additional income tax penalty on early distributions will not apply (unless you take the amount rolled over out of the designated Roth account within the 5-year period that begins on January 1 of the year of the rollover). For payments from the plan in 2010 that are rolled over to a designated Roth account in the plan (and that are not distributed from that account until after 2011), the taxable amount of the rollover will be taxed half in 2011 and half in 2012, unless you elect to be taxed in If you roll over the payment to a designated Roth account in the plan, later payments from the designated Roth account that are qualified distributions will not be taxed (including earnings after the rollover). A qualified distribution from a designated Roth account is a payment made both after you attain age 59½ (or after your death or disability) and after you have had a designated Roth account in the plan for a period of at least 5 years. The 5-year period described in the preceding sentence begins on January 1 of the year your first contribution was made to the designated Roth account. However, if you made a direct rollover to a designated Roth account in the plan from a designated Roth account in a plan of another employer, the 5- year period begins on January 1 of the year your first contribution was made to the designated Roth account in the plan or, if earlier, to the designated Roth account in the plan of the other employer. Payments from the designated Roth account that are not qualified distributions will be taxed to the extent allocable to earnings after the rollover, including the 10% additional income tax penalty on early distributions (unless an exception applies). Page 10 of 16 If you are a surviving spouse. 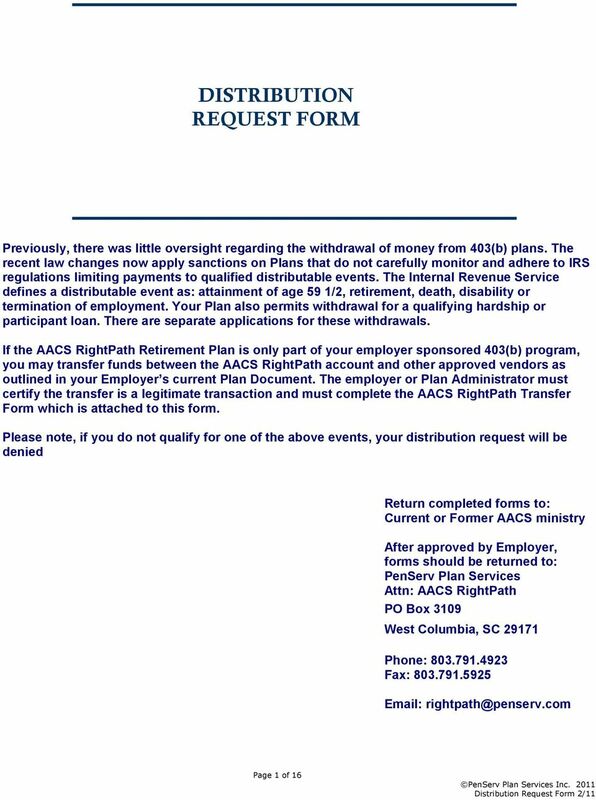 If you receive a payment from the Plan as the surviving spouse of a deceased participant, you have the same rollover options that the participant would have had, as described elsewhere in this notice. In addition, if you choose to elect a rollover to an IRA, you may treat the IRA as your own or as an inherited IRA. An IRA you treat as your own is treated like any other IRA of yours, so that payments made to you before you are age 59½ will be subject to the 10% additional income tax penalty on early distributions (unless an exception applies) and Required Minimum Distributions from your IRA do not have to start until after you are age 70½. If you treat the IRA as an inherited IRA, payments from the IRA will not be subject to the 10% additional income tax penalty on early distributions. However, if the participant had started taking Required Minimum Distributions, you will have to receive Required Minimum Distributions from the inherited IRA. If the participant had not started taking Required Minimum Distributions from the Plan, you will not have to start receiving Required Minimum Distributions from the inherited IRA until the year the participant would have been age 70½. If you are a surviving beneficiary other than a spouse. If you receive a payment from the Plan because of the participant s death and you are a designated beneficiary other than a surviving spouse, the only rollover option you have is to do a direct rollover to an inherited IRA. Payments from the inherited IRA will not be subject to the 10% additional income tax penalty on early distributions. You will have to receive Required Minimum Distributions from the inherited IRA. Payments under a Qualified Domestic Relations Order. If you are the spouse or former spouse of the participant who receives a payment from the Plan under a Qualified Domestic Relations Order (QDRO), you generally have the same options the participant would have (for example, you may roll over the payment to your own IRA or an eligible employer plan that will accept it). Payments under the QDRO will not be subject to the 10% additional income tax penalty on early distributions. If you are a nonresident alien If you are a nonresident alien and you do not elect a direct rollover to a U.S. IRA or U.S. employer plan, instead of withholding 20%, the Plan is generally required to withhold 30% of the payment for federal income taxes. 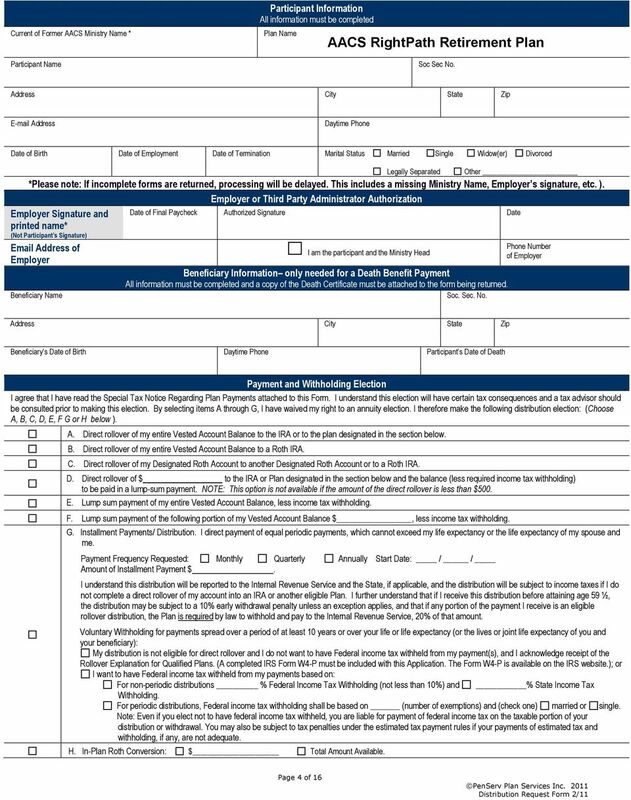 If the amount withheld exceeds the amount of tax you owe (as may happen if you do a 60-day rollover), you may request an income tax refund by filing Form 1040NR and attaching your Form 1042-S. See Form W- 8BEN for claiming that you are entitled to a reduced rate of withholding under an income tax treaty. For more information, see also IRS Publication 519, U.S. Tax Guide for Aliens, and IRS Publication 515, Withholding of Tax on Nonresident Aliens and Foreign Entities. Other special rules If a payment is one in a series of payments for less than 10 years, your choice whether to make a direct rollover will apply to all later payments in the series (unless you make a different choice for later payments). 11 If your payments for the year are less than $200 (not including payments from a designated Roth account in the Plan), the Plan is not required to allow you to do a direct rollover and is not required to withhold for federal income taxes. However, you may do a 60-day rollover. Unless you elect otherwise, a mandatory cashout of more than $1,000 (not including payments from a designated Roth account in the Plan) will be directly rolled over to an IRA chosen by the Plan administrator or the payor. A mandatory cashout is a payment from a plan to a participant made before age 62 (or normal retirement age, if later) and without consent, where the participant s benefit does not exceed $5,000 (not including any amounts held under the plan as a result of a prior rollover made to the plan). You may have special rollover rights if you recently served in the U.S. Armed Forces. For more information, see IRS Publication 3, Armed Forces Tax Guide. FOR MORE INFORMATION You may wish to consult with the Plan administrator or payor, or a professional tax advisor, before taking a payment from the Plan. Also, you can find more detailed information on the federal tax treatment of payments from employer plans in: IRS Publication 575, Pension and Annuity Income; IRS Publication 590, Individual Retirement Arrangements (IRAs); and IRS Publication 571, Tax-Sheltered Annuity Plans (403(b) Plans). These publications are available from a local IRS office, on the web at or by calling TAX-FORM. 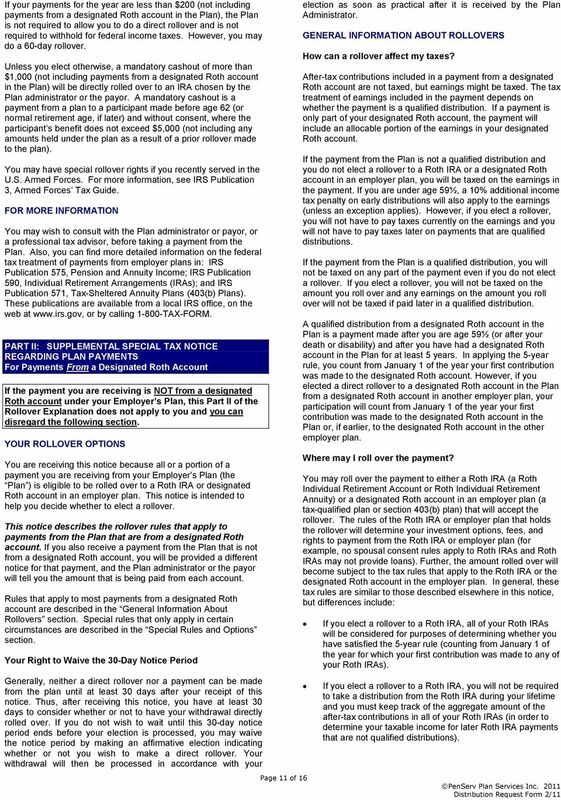 PART II: SUPPLEMENTAL SPECIAL TAX NOTICE REGARDING PLAN PAYMENTS For Payments From a Designated Roth Account If the payment you are receiving is NOT from a designated Roth account under your Employer s Plan, this Part II of the Rollover Explanation does not apply to you and you can disregard the following section. YOUR ROLLOVER OPTIONS You are receiving this notice because all or a portion of a payment you are receiving from your Employer s Plan (the Plan ) is eligible to be rolled over to a Roth IRA or designated Roth account in an employer plan. This notice is intended to help you decide whether to elect a rollover. 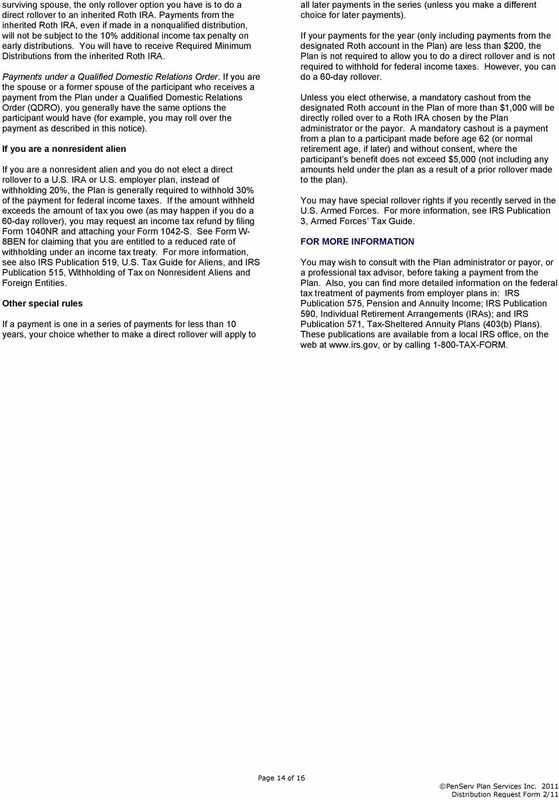 This notice describes the rollover rules that apply to payments from the Plan that are from a designated Roth account. 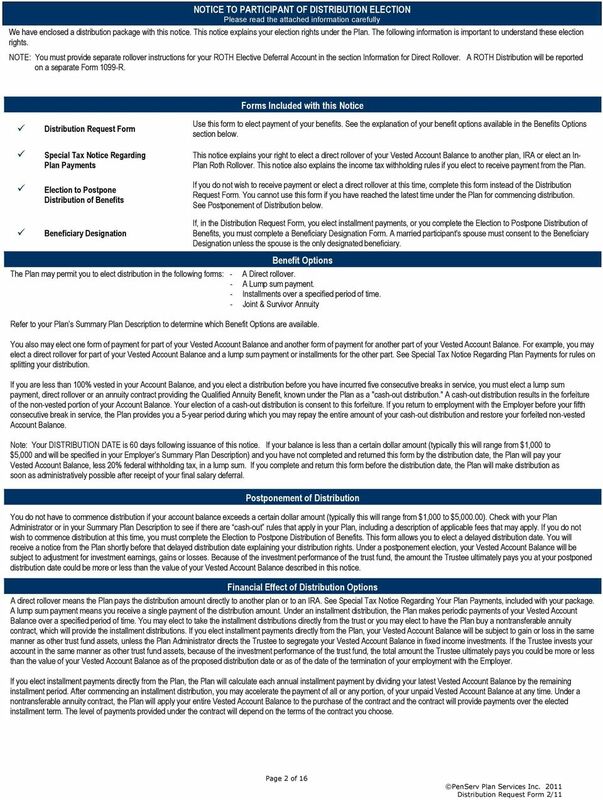 If you also receive a payment from the Plan that is not from a designated Roth account, you will be provided a different notice for that payment, and the Plan administrator or the payor will tell you the amount that is being paid from each account. Rules that apply to most payments from a designated Roth account are described in the General Information About Rollovers section. Special rules that only apply in certain circumstances are described in the Special Rules and Options section. Your Right to Waive the 30-Day Notice Period Generally, neither a direct rollover nor a payment can be made from the plan until at least 30 days after your receipt of this notice. Thus, after receiving this notice, you have at least 30 days to consider whether or not to have your withdrawal directly rolled over. If you do not wish to wait until this 30-day notice period ends before your election is processed, you may waive the notice period by making an affirmative election indicating whether or not you wish to make a direct rollover. Your withdrawal will then be processed in accordance with your Page 11 of 16 election as soon as practical after it is received by the Plan Administrator. GENERAL INFORMATION ABOUT ROLLOVERS How can a rollover affect my taxes? After-tax contributions included in a payment from a designated Roth account are not taxed, but earnings might be taxed. The tax treatment of earnings included in the payment depends on whether the payment is a qualified distribution. If a payment is only part of your designated Roth account, the payment will include an allocable portion of the earnings in your designated Roth account. If the payment from the Plan is not a qualified distribution and you do not elect a rollover to a Roth IRA or a designated Roth account in an employer plan, you will be taxed on the earnings in the payment. If you are under age 59½, a 10% additional income tax penalty on early distributions will also apply to the earnings (unless an exception applies). However, if you elect a rollover, you will not have to pay taxes currently on the earnings and you will not have to pay taxes later on payments that are qualified distributions. If the payment from the Plan is a qualified distribution, you will not be taxed on any part of the payment even if you do not elect a rollover. If you elect a rollover, you will not be taxed on the amount you roll over and any earnings on the amount you roll over will not be taxed if paid later in a qualified distribution. A qualified distribution from a designated Roth account in the Plan is a payment made after you are age 59½ (or after your death or disability) and after you have had a designated Roth account in the Plan for at least 5 years. In applying the 5-year rule, you count from January 1 of the year your first contribution was made to the designated Roth account. 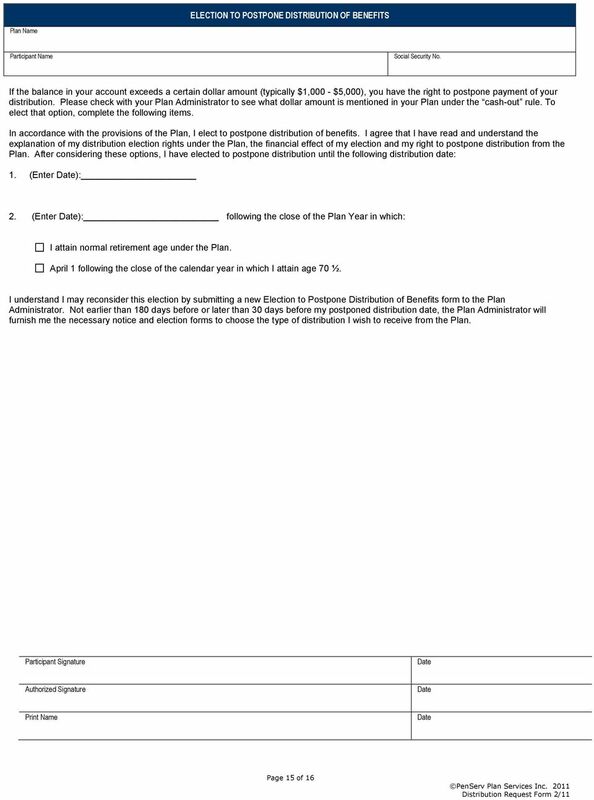 However, if you elected a direct rollover to a designated Roth account in the Plan from a designated Roth account in another employer plan, your participation will count from January 1 of the year your first contribution was made to the designated Roth account in the Plan or, if earlier, to the designated Roth account in the other employer plan. Where may I roll over the payment? You may roll over the payment to either a Roth IRA (a Roth Individual Retirement Account or Roth Individual Retirement Annuity) or a designated Roth account in an employer plan (a tax-qualified plan or section 403(b) plan) that will accept the rollover. The rules of the Roth IRA or employer plan that holds the rollover will determine your investment options, fees, and rights to payment from the Roth IRA or employer plan (for example, no spousal consent rules apply to Roth IRAs and Roth IRAs may not provide loans). Further, the amount rolled over will become subject to the tax rules that apply to the Roth IRA or the designated Roth account in the employer plan. 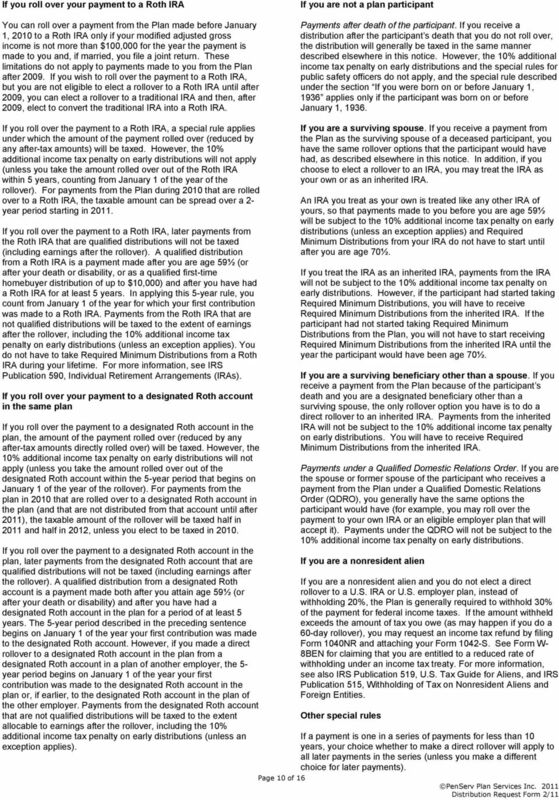 In general, these tax rules are similar to those described elsewhere in this notice, but differences include: If you elect a rollover to a Roth IRA, all of your Roth IRAs will be considered for purposes of determining whether you have satisfied the 5-year rule (counting from January 1 of the year for which your first contribution was made to any of your Roth IRAs). If you elect a rollover to a Roth IRA, you will not be required to take a distribution from the Roth IRA during your lifetime and you must keep track of the aggregate amount of the after-tax contributions in all of your Roth IRAs (in order to determine your taxable income for later Roth IRA payments that are not qualified distributions). 12 Eligible rollover distributions from a Roth IRA can only be rolled over to another Roth IRA. How do I elect a rollover? There are two ways to elect a rollover. You can either elect a direct rollover or a 60-day rollover. If you elect a direct rollover, the Plan will make the payment directly to your Roth IRA or designated Roth account in an employer plan. You should contact the Roth IRA sponsor or the administrator of the employer plan for information on how to elect a direct rollover. If you do not elect a direct rollover, you may still elect a rollover by making a deposit within 60 days into a Roth IRA, whether the payment is a qualified or nonqualified distribution. In addition, you can elect a rollover by making a deposit within 60 days into a designated Roth account in an employer plan if the payment is a nonqualified distribution and the rollover does not exceed the amount of the earnings in the payment. You cannot elect a 60- day rollover to an employer plan of any part of a qualified distribution. If you receive a distribution that is a nonqualified distribution and you elect not to roll over an amount at least equal to the earnings allocable to the distribution, you will be taxed on the amount of those earnings not rolled over, including the 10% additional income tax penalty on early distributions if you are under age 59½ (unless an exception applies). If you elect a direct rollover of only a portion of the amount paid from the Plan and a portion is paid to you, each of the payments will include an allocable portion of the earnings in your designated Roth account. there will generally be adverse tax consequences if S corporation stock is held by an IRA). The Plan administrator or the payor can tell you what portion of a payment is eligible for rollover. If I don t elect a rollover, will I have to pay the 10% additional income tax penalty on early distributions? 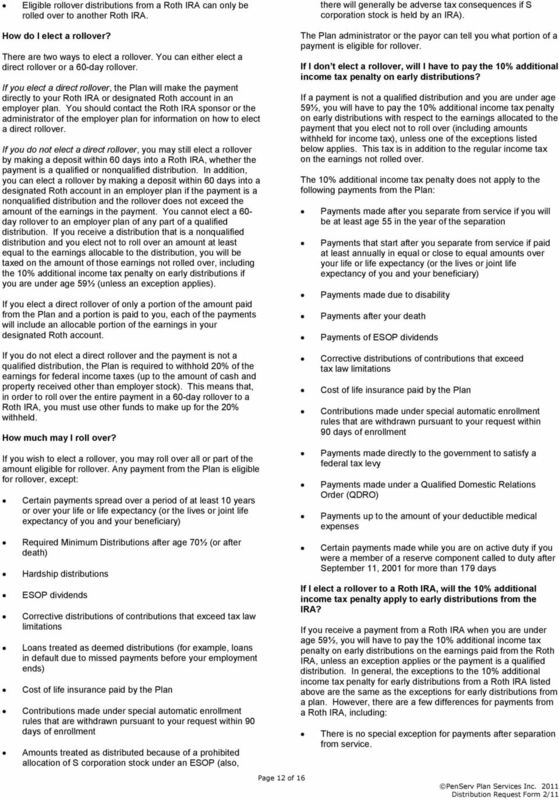 If a payment is not a qualified distribution and you are under age 59½, you will have to pay the 10% additional income tax penalty on early distributions with respect to the earnings allocated to the payment that you elect not to roll over (including amounts withheld for income tax), unless one of the exceptions listed below applies. This tax is in addition to the regular income tax on the earnings not rolled over. 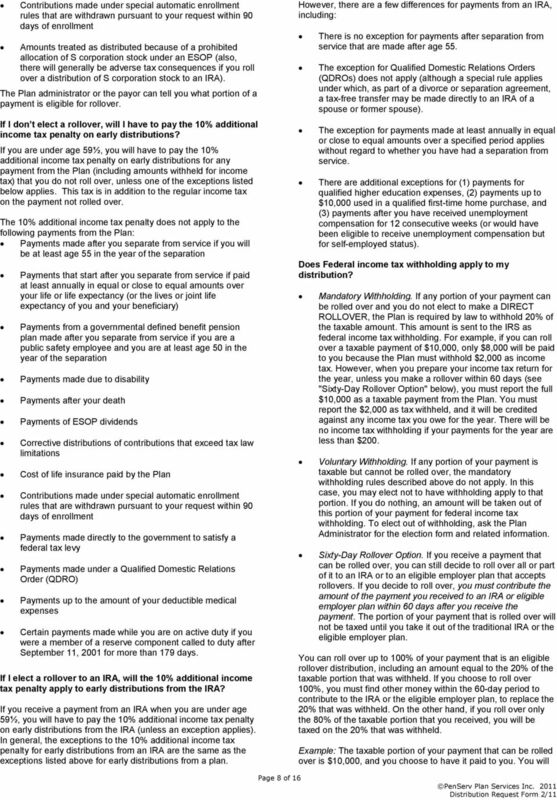 The 10% additional income tax penalty does not apply to the following payments from the Plan: Payments made after you separate from service if you will be at least age 55 in the year of the separation Payments that start after you separate from service if paid at least annually in equal or close to equal amounts over your life or life expectancy (or the lives or joint life expectancy of you and your beneficiary) Payments made due to disability Payments after your death Payments of ESOP dividends If you do not elect a direct rollover and the payment is not a qualified distribution, the Plan is required to withhold 20% of the earnings for federal income taxes (up to the amount of cash and property received other than employer stock). This means that, in order to roll over the entire payment in a 60-day rollover to a Roth IRA, you must use other funds to make up for the 20% withheld. How much may I roll over? If you wish to elect a rollover, you may roll over all or part of the amount eligible for rollover. 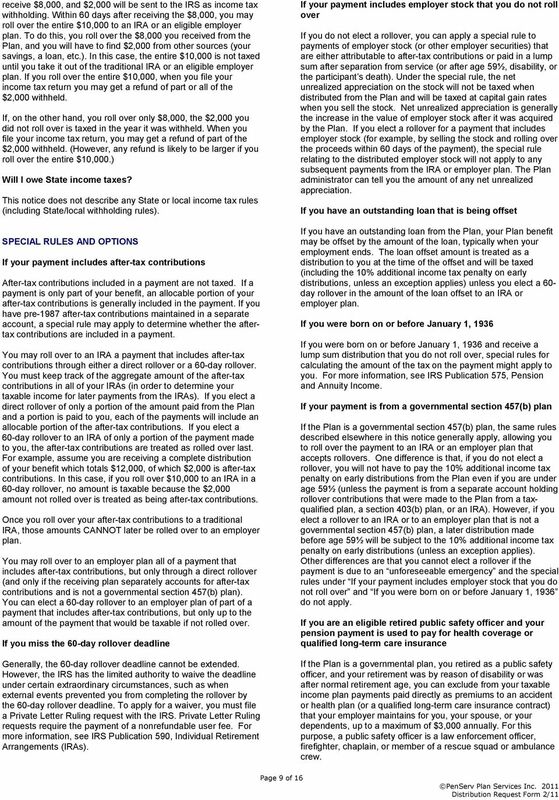 Any payment from the Plan is eligible for rollover, except: Certain payments spread over a period of at least 10 years or over your life or life expectancy (or the lives or joint life expectancy of you and your beneficiary) Required Minimum Distributions after age 70½ (or after death) Hardship distributions ESOP dividends Corrective distributions of contributions that exceed tax law limitations Loans treated as deemed distributions (for example, loans in default due to missed payments before your employment ends) Cost of life insurance paid by the Plan Contributions made under special automatic enrollment rules that are withdrawn pursuant to your request within 90 days of enrollment Amounts treated as distributed because of a prohibited allocation of S corporation stock under an ESOP (also, Page 12 of 16 Corrective distributions of contributions that exceed tax law limitations Cost of life insurance paid by the Plan Contributions made under special automatic enrollment rules that are withdrawn pursuant to your request within 90 days of enrollment Payments made directly to the government to satisfy a federal tax levy Payments made under a Qualified Domestic Relations Order (QDRO) Payments up to the amount of your deductible medical expenses Certain payments made while you are on active duty if you were a member of a reserve component called to duty after September 11, 2001 for more than 179 days If I elect a rollover to a Roth IRA, will the 10% additional income tax penalty apply to early distributions from the IRA? If you receive a payment from a Roth IRA when you are under age 59½, you will have to pay the 10% additional income tax penalty on early distributions on the earnings paid from the Roth IRA, unless an exception applies or the payment is a qualified distribution. In general, the exceptions to the 10% additional income tax penalty for early distributions from a Roth IRA listed above are the same as the exceptions for early distributions from a plan. However, there are a few differences for payments from a Roth IRA, including: There is no special exception for payments after separation from service. General Information About Rollovers. Where may I roll over the payment? Payments from a Designated Roth Account. 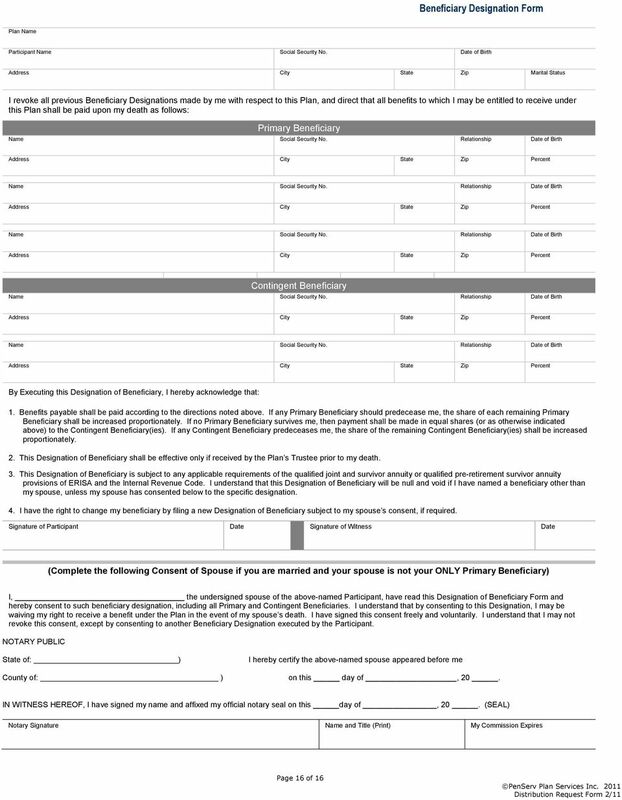 PARTICIPANT DISTRIBUTION FORM Please read the Frequently Asked Questions (FAQ) attached to this form. 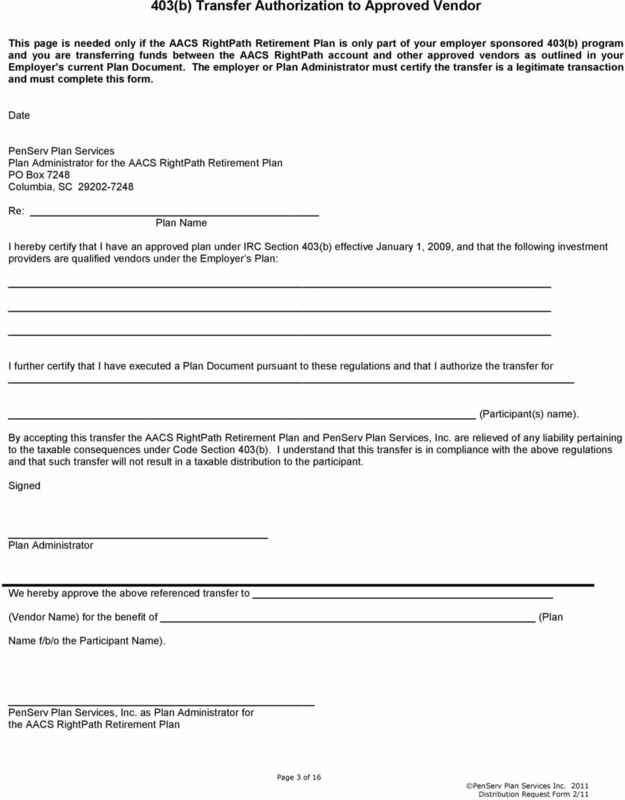 Submit the completed form to the Plan Sponsor. 1. Participant Information Please print clearly in CAPITAL LETTERS. 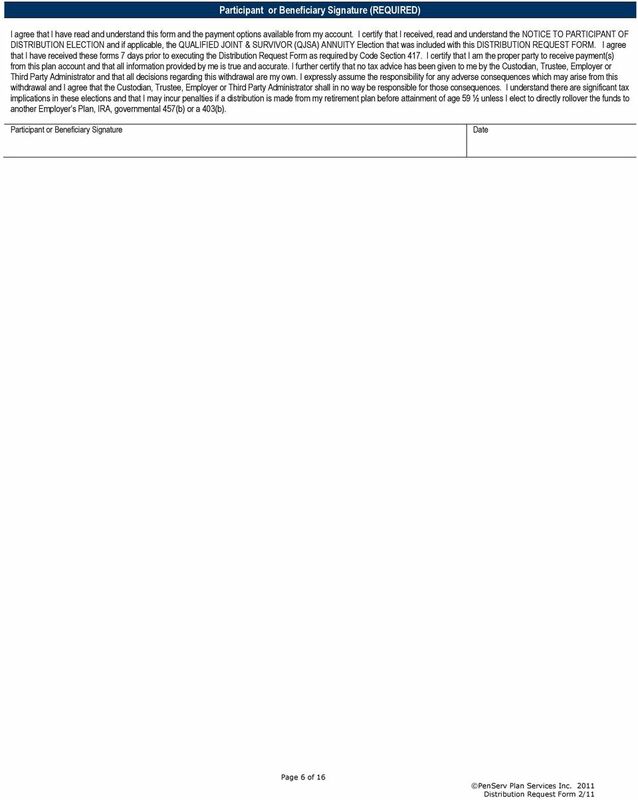 REQUIRED MINIMUM DISTRIBUTION FORM PLAN NAME: PLAN NUMBER: Use this form to request a required minimum distribution following attainment of age 70½, unless you are still employed and are not a 5% owner. 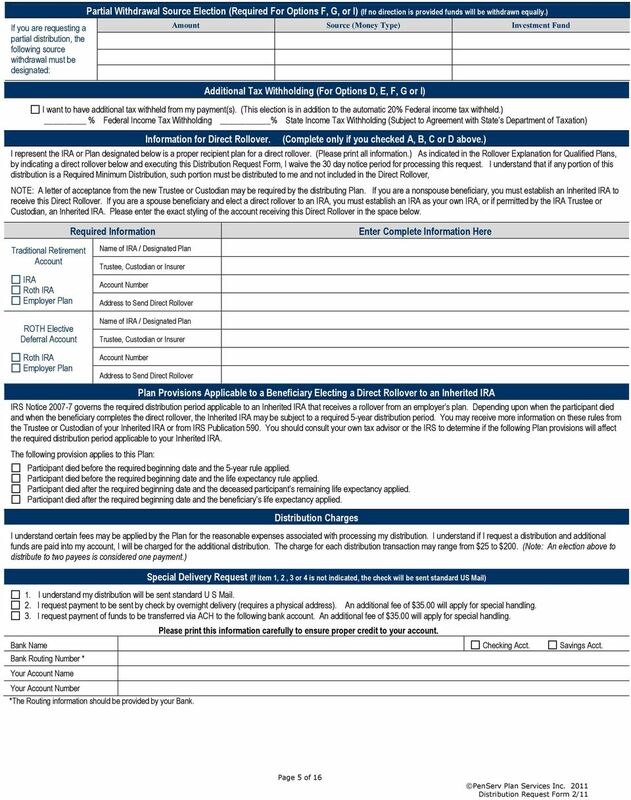 INSTRUCTIONS FOR PARTICIPANT DISTRIBUTIONS Your distribution package includes a Distribution Request Form ("Form"), a Participant Distribution Notice, and a Special Tax Notice Regarding Plan Payments. IMPORTANT INFORMATION Distribution Election Form Please complete the form in its entirety. Missing pages and/or incomplete forms will delay processing. After completion, please return form to Pension Inc.